What started off as curiosity of urban farming by two college friends developed into Back To Your Roots, a progressive company that pride themselves on food that is made in the kitchen not the lab. 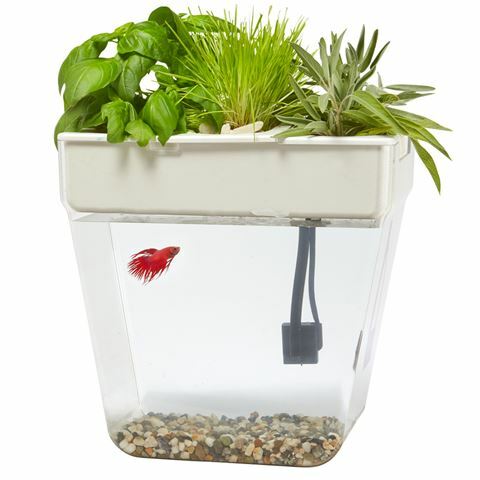 The Water Garden 2.0 is a self-cleaning fish tank that grows organic sprouts and herbs. Working with the help of a self-cleaning cycle, the plants and your fish help each other to prosper. The fish produces nutrient rich waste which is taken up in a tube filter to the plants as food and they will continue to grow. Then clean filtered water then drops back down to the fish. This pack includes everything you need to get started and is a low maintenance, mini eco-system. Great for a family or classroom project. Self-cleaning fish tank that grows plants on top. Plant, grow and harvest your own garden. Natural fish waste fertilizes plants, and the plants clean the water – no weekly water changes needed! Comes with certified organic seeds. Seeds should be ready to harvest ten days after planting. Presented in a Back To Your Roots box. Fish Tank – Approx. 27.9cm (l) x 30.5cm (h) x 20.3cm (w). Organic Wheatgrass and Microgreen Seeds. FREE downloadable online curriculum for kids about the science behind aquaphonics.